So, I know lots of you have been wondering where I went. I got a few worried e-mails so I decided to carve the time out of today to give you all a quick hello. In the last few days I have heard my name all too many times. And lots of jokes about the storm that brought NYC to it's knees. I'm not proud of the fact that I share the name of the craziest storm to hit my city since I've been alive. Thankfully, all we lost was power for a week. There are so many other people who lost so much more and are struggling to piece their lives back together. One thing I can tell you is that I am SO happy that as a family we listened to all the warnings and suggestions. We prepared go-bags. We bought candles and water and canned soups and granola bars in abundance. We got batteries and filled up our gas tank (which was the absolute BEST thing we ever did) and we did our laundry before the storm. I know those don't sound like major things but doing the laundry meant we had clean clothes for the entire week we were without power. And filling up our gas tank meant that we didn't stay stuck like so many others have. We had to finally find gas last night and hubby went out at 2am. After an hour he was back but not without a story. Seems like our local gas station conveniently decided to "only" have super-grade gasoline. So we wound up spending over $100 to fill our tank and get 5 gallons for my sister who is currently out of gas. A total of about 18 gallons for $100??!! It's maddening. But it just goes to show the state of the world. People taking advantage of others at the worst times. Doesn't shock me at all. On the other hand, there has also been a huge outpouring of love all over the city. Lots of people taking part in drives and fundraisers and collections for those who lost everything. New York has a really bad reputation when it comes to people being nice. And, yes, there are the few who feed that misconception, but for the most part New Yorkers care and help each other out. My brother-in-law shared this link with me and I found it to be one of the most powerful things I've ever seen. None of these are the crazy photoshopped pics that floated around. These are real. I know many people that were poking fun at NY for not knowing how to react to a storm. But, HELLO, this has never happened before. Unlike Florida, our trees don't sway with the wind gusts and our houses have basements! DUH. This is not exactly supposed to happen here. As if Sandy wasn't enough we then got pummeled with a ridiculous snowstorm the day after we got power restored (thank goodness - that we got power restored, that is). Whatever trees didn't fall from the hurricane couldn't stand up to the wet, heavy snow that weighed them down as they still hung on to their pretty fall leaves. I tell you, I've lived here all my life and never imagined I'd witness something like this. We always thought we lived in a "protected" city where natural disasters weren't an issue. Lesson learned. On another note, this is my official 200th post! Of course, this is actually way more than my 200th post but a while back I decided to go back into my archives and delete posts that I wasn't very happy with. So, here's to the official thing! YAY! 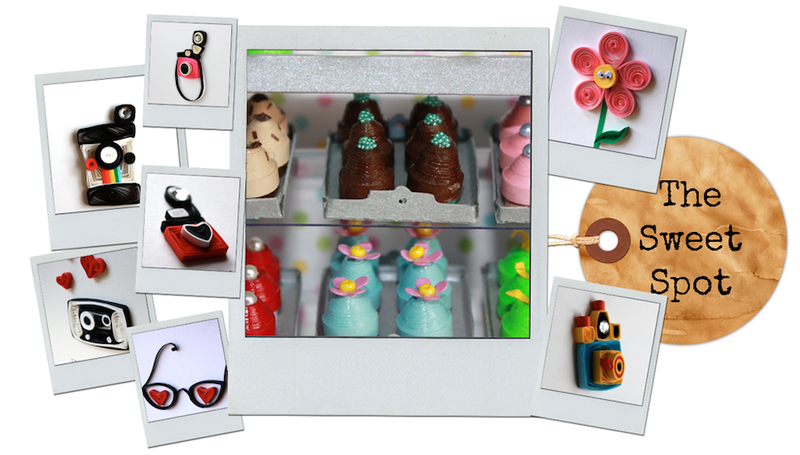 If you haven't already, please check out Discover Paper's Holiday Guide. I wish it was in print so I could sit down and ponder over it with a huge cup of coffee. Wouldn't that be awesome? You'll find Sweet Spot featured under the "Support Handmade" section as well as under the paper snowflakes section at the end. There's also an amazing giveaway going on. I hadn't made a paper snowflake since Junior High School so it was kind of fun. I didn't want to make a white one. Even though snow is white it doesn't exactly stay that color here in the city. So, I decided to make a colorful creation which, if melted, would resemble tie dye or 7-11 Slushies! ;) Wouldn't that be a sight to see? Here is my snowflake. The pics are mediocre because the sun hasn't exactly favored this side of the world as of late. Snowflakes are a great way to practice your quilling shapes and put them together in great and unique patterns. You should definitely give it a try! It's also a nice distraction and stress reliever. Oh, before I forget, I used this guide to make my snowflake. You can download your own and print and re-print as many as you'd like because Cecilia is awesome and a great sharer! ;) I printed a grid and placed it over a cork mat so I could pin the shapes as I went along. I hope you have an amazing weekend with no stormy weather in sight! it's a relief that you and your family are alright. and congrats on making into the holiday guide feature. Good to know that you're doing fine..The snowflake is so cute and lively..
TV channels in India also showed the news about sandy and the loss it bought !Good that you were prepared to face the power-cut problems. 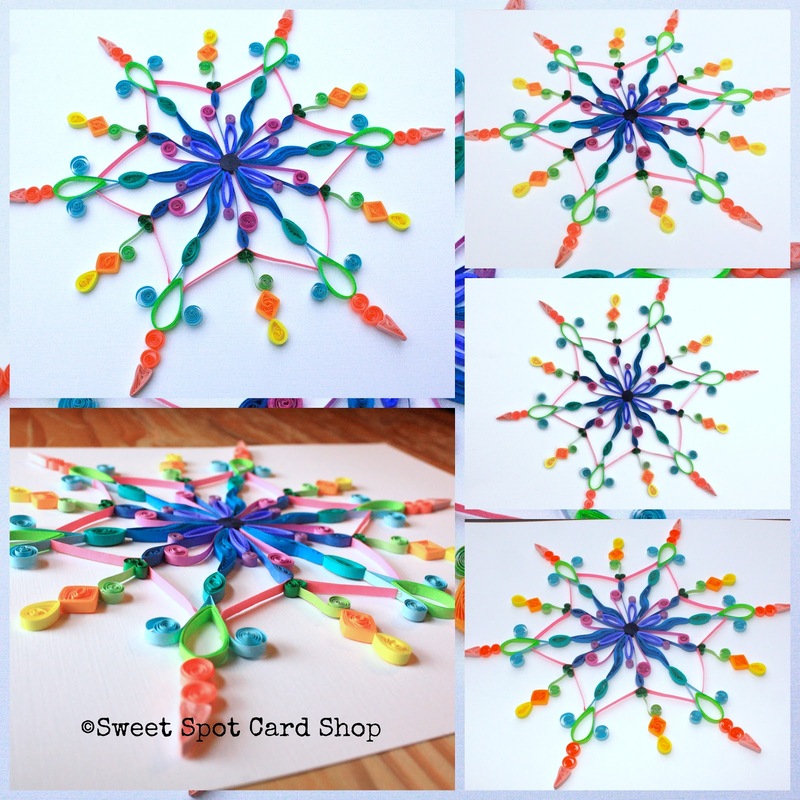 The quilled snowflakes are beautiful colorful and delicate ! Thank you, Pooja. Yes, preparation is key! glad your all ok and smart idea to be prepared, yes it is ashamed how people take advanage of hardship, love your snow flake!!! 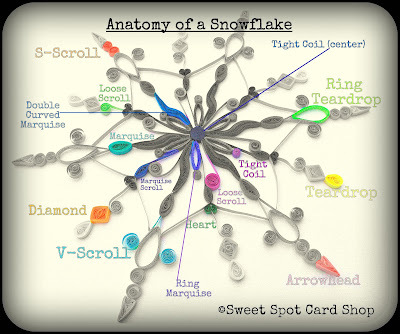 Sandy, your snowflakes are gorgeous, and I love your 'anatomy' idea!! I'm so to hear that you survived the storm unscathed - it must have been a terrifying time for everyone.